Obesity, diabetes, heart disease, and cancer—all diseases that have been scientifically linked to diet—are at an all-time high. But there’s a way to prevent and fight these diseases that has been successful for millions of people for thousands of years: the Mediterranean diet. 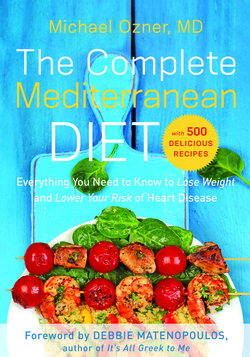 In The Complete Mediterranean Diet, top cardiologist Michael Ozner offers the traditional Mediterranean diet—clinically proven to reduce your risk of heart disease, cancer, and numerous other diseases—with the latest scientific findings in health and nutrition to create a diet that is easy to follow. With a foreword by Debbie Matenopoulos, The Complete Mediterranean Diet shows you how and why to change your diet for a longer, healthier, happier life. and reduce your risk of a heart attack. · * Learn how snoring (and sleep apnea) can cause a heart attack – and how to prevent it. Cardiologist introduces Americans to the healthiest, most enjoyable weight-loss diet ever created. Imagine washing down chilled, crunchy Caesar salad and mouth-watering lemony, garlicky chicken with a glass of red wine, followed by sweet Italian rice pudding. Does this sound like a diet? It’s not a diet, says world-renowned cardiologist Michael Ozner, MD. It’s part of the healthy lifestyle enjoyed by Mediterranean cultures—one that emphasizes fresh whole foods enjoyed with friends and family, leisurely walks, naps, wine, and laughter. Prevention, says Dr. Ozner, is our best weapon against heart disease—not intervention. The Miami Mediterranean Diet is so enjoyable and simple to follow that it could prevent thousands of deaths a year and change the way we think about dieting forever. 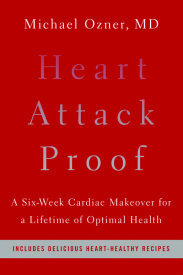 Groundbreaking new book exposes the cardiology industry’s dirty little secret. The bad news: Most heart surgery performed on stable individuals is unnecessary, and most surgical interventions are costly, risky, and ineffective because they don’t address the underlying cause of heart disease. The good news: Heart disease is preventable and reversible, and the best clinically proven way to cure it is both safe and low cost. The newest book by internationally acclaimed cardiologist Michael Ozner, MD, The Great American Heart Hoax (BenBella Books, 2008), offers the first eye-opening look inside the cardiology industry’s refusal to acknowledge that the current surgical treatments for heart disease aren’t working. Citing numerous scientific studies on the high risk and low efficacy of bypass surgery and angioplasty—70 to 90 percent of which are unnecessary and don’t prevent future heart attacks—Dr. Ozner shows readers why they should avoid these procedures. More important, he shows heart patients what to do instead. Dr. Ozner has been practicing preventive cardiology for nearly three decades, and his noninvasive approach focusing on lifestyle changes such as diet, exercise, stress reduction, and the judicious use of medications has helped thousands of heart patients avoid surgery and live long, healthy lives. For heart patients as well as those wishing never to become a heart patient, this eyeopening book offers lifesaving advice your doctor should tell you about heart disease prevention—but probably never will.